Elephants are large mammals with long trunks. Some elephant species in Indonesia are even endemic animals found only in Sumatra, Java and Kalimantan. Elephants belong to endangered animal categories and need to be protected. But many of the elephants died from being shot or poisoned in Sumatra, especially in Riau. That, according to a WWF report, shows the weakness of law enforcement against wild hunters in the region. It is undeniable that the government has also tried to conserve elephant habitat with the aim of conservation. But it seems, this business is not running smoothly because the number of elephant population decreased from year to year. Here are the reasons why are elephants endangered in Indonesia. The main factor causing the animals extinction on earth is the loss of habitat or residence. A variety of ecosystems both on land and in the sea are in vain for the construction of buildings, roads and other developments. The transfer of forest functions to plantations also causes the population of elephants in Indonesia to decline. No wonder if in the area of Sumatra many elephants are to roam in the homes of citizens. It must be a serious problem to make the bigger effort of this animal preservation. It has ben well known that the elephant tusks sold in a very high price. Of the 150 Sumatran elephants found dead, the WWF notes that most of the elephant tusks have been stolen. The motive of death of elephants in Indonesia is very diverse. Some are hunted using firearms, some other are poisoned. Usually a kilo of elephant tusk is purchased for Rp 15 million (ordinary ivory category). As for the ivory with super quality, the price per kilo can reach Rp 20 million to Rp 30 million. It is so fantastic price! Natural disasters that occur are also the cause of the extinction of elephants in Indonesia. Flash floods due to the damage on the ground causes their species to become increasingly scarce. Moreover, excessive exploitation of nature will cause landslides that will cause their habitat to be further damaged and elephants lost their homes. Forest and land fires not only threaten human life, but also animals and plants in the fire area. Wildlife that is easily threatened by forest fires and exposed to smoke is the Sumatran tiger and elephant. Fires have also caused the Sumatran elephant roaming route to change. Changes in elephant roaming routes can be fatal. Elephants will take routes that penetrate into the settlements of citizens that can cause conflicts. Air pollution not only causes the human respiratory system to be disturbed, but also a factor causing animal extinction to occur in Indonesia. Indirectly, air pollution causes an imbalance of ecosystems that cause various disasters occur. This can cause some endemic animals to lose their original habitat. For this reason, indirect air pollution contributes to this animal extinction factor. Exploitation of organs on elephants is the main reason for poaching where they are eyeing the economic benefits from the sale of ivory ivory which is very tempting price. Currently, the latest news tells us that hunting behavior is becoming more wild and desperate. They are not half-hearted in doing the hunt until it is right to mutilate the elephant’s head to make it easier to take the tusk without the animal safety officer. The illegal huntung dominates the death rate of Sumatran elephants (Elephas maximus sumatrensis) in Indonesia. According to him, the elephants were killed by being poisoned and shot. Once killed, the tusks are taken as valuable parts of the elephant. Motive loss of ivory, it is considered deliberately hunted to be killed and taken part. 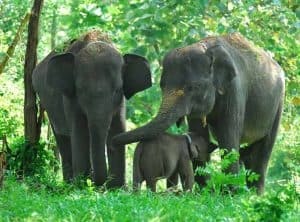 The problem of human and animal conflicts that occurred due to the increase of previous plantation area is the area of the elephant herd exploration. While the characteristics of elephants is to mark the area of cruising hereditary including the lithasannya. It is undeniable that climate change in Indonesia is also a result of human activity itself. As a result of climate change, the weather is increasingly uncertain. Long droughts, even the increasingly frequent rainy season, claim the elephant to lose its food source. This is what causes elephants increasingly rare in Indonesia. Not to mention the elephants began to come to the village residents to find water and their food sources. Elephants are mammals with the longest period of pregnancy. An elephant generally contains more than 18 months and sometimes even reaches the age of 2 years. The average elephant gestation period is between 640 to 660 days. A female elephant with the age of 60 to 70 years in general can only have children four times. At the time a female elephant will give birth, another group of elephants used to form a line of protection around the female elephant that is believed to be a form of compassion and guarding during the birth of a baby elephant. The long term of regeneration for elephants adding the factors of this animal in endangered status. Due to the hunting of carnivorous animal food sources will further shrink and resulted in the extinction of food sources so that eventually will become extinct. For example, many herbivorous animals are hunted so that over time it will become extinct so carnivorous animals will starve and mass starvation will cause the extinction of the species. Herbivorous animals like elephant will become extinct if their food source is depleted due to the destruction of the animal’s habitat. So that herbivorous animals will gradually become extinct. The loss of forests in Indonesia has reached a critical point. In Sumatra, the conversion of forest into plantation land becomes more massive. There are now many elephant trajectories that have switched functions, causing the large beasts to emerge from their habitats to try to survive. Their population is becoming less and more will lose their homes. Not to mention the threat of poaching. Elephants are carnivorous animals that feed on plants. The more forests are cut down, the more elephants lose their food sources. While in the remaining forests that still exist, there are still many other wild animals that can eat elephants at any time. Elephants that belong to large animals and use certain places as their homes, will be more difficult to pass natural selection. Those are the reason why elephant are endangered in Indonesia. Hopefully, Indonesians will contribute to support the government’s efforts in the conservation of elephants. It is expected they can open their eyes that elephants are protected animals that can not be arbitrarily rushed to get their tusks.